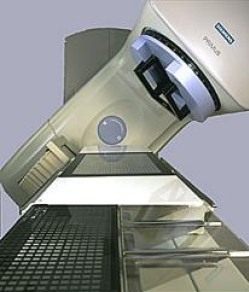 Used Oncology Equipment and Linear Accelerators For Sale. 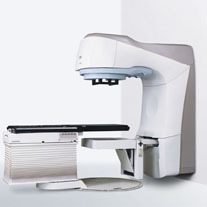 Refurbished, Pre-Owned & Reconditioned Oncology Equipment and Linear Accelerators, at Reasonable Prices. Used and Refurbished Radiology Equipment and X-Ray Equipment, Used and Refurbished Diagnostic Imaging Equipment, Used Cath Labs, Used C-Arms, Used MRI Systems, Used CT Scanners, Used PET Scanners, Used Nuclear Medicine Equipment, Used Mammography Equipment, Used Fluroscopy Equipment and Used Cardiology Equipment. The linear accelerator uses microwave technology (similar to that used for radar) to accelerate electrons in a part of the accelerator called the "wave guide", then allows these electrons to collide with a heavy metal target. As a result of the collisions, high-energy x-rays are scattered from the target. A portion of these x-rays is collected and then shaped to form a beam that matches the patient's tumor. The beam comes out of a part of the accelerator called a gantry, which rotates around the patient. The patient lies on a moveable treatment couch and lasers are used to make sure the patient is in the proper position. 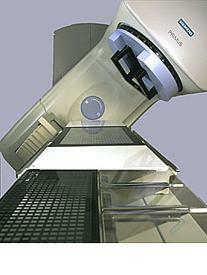 Radiation can be delivered to the tumor from any angle by rotating the gantry and moving the treatment couch. The linear accelerator can also be used in stereotactic radiosurgery similar to that achieved using the gamma knife on targets within the brain. The linear accelerator can also be used to treat areas outside of the brain. It delivers a uniform dose of high-energy x-ray to the region of the patient's tumor. These x-rays can destroy the cancer cells while sparing the surrounding normal tissue. 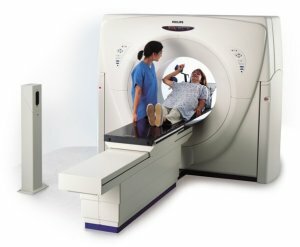 CT Scanners . . . Radiation Therapy . . .